The very mention of Bengali cuisine brings to mind the rich desserts like sandesh, rossogulla and rajbhog or the simple and tasty fish dishes like machher jhol, yet it is the vegan fare that is as tasty and make for a good meal. Dishes like Aloo Potol, Shukto and cholar dal may not have found its way to many non-bengali households or fancy restaurant menus, but once they do, atleast in our households they gain prominence and become a repeat favorite. 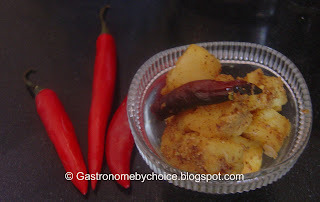 Aloo Poshto is one such dish. Poshto, Short for Poshtodana which is the Bengali name for Poppy Seeds, literally translated means Potatoes with Poppy Seeds. Green Chillies - 2 No. 1. Roast the poppy seeds and alongwith green chillies and a few tablespoons of water, grind it to a smooth paste. 4. Shallow Fry potatoes till light brown. Drain and keep aside. 5. 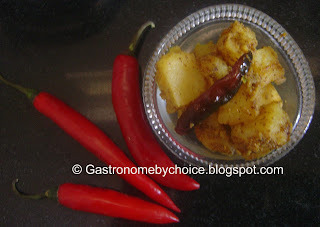 In the same oil, add whole dry red chillies and turmeric powder. Fry briefly. 6. Add in the poppy seed paste and fry for 4-5 minutes or till oil starts leaving sides of the pan. 7. Add the lightly fried potatoes and mix well. 8. Add water and salt. Stir well. 9. Cook till potatoes are soft and the dish turns a little dry. Note: This is also my post for Sandeepa's RCI - Bengal event. wow, didn't know anything like that existed! :) looks great Gaurav! Yeh Cheese(Cake) bada hai mast mast !! !